Planned Parenthood confirmed the meeting to Jezebel, saying in a statement that Richards used the sit-down to explain what the Republican platform of defunding Planned Parenthood really means. “The purpose of the meeting, from Planned Parenthood’s perspective, was to make sure that Ivanka Trump fully understood the important role Planned Parenthood plays in providing health care to millions of people and why it would be a disastrous idea to block people from accessing care at Planned Parenthood,” the organization said. “It was also important to clear up any misinformation regarding the Medicaid reimbursements Planned Parenthood receives and explain that Planned Parenthood is reimbursed the same way hospitals are,” Planned Parenthood added. Little seems to have come of the meeting—or, at least, Ivanka has said very little about the meeting. In a recent interview with CBS This Morning, Ivanka defended her deafening silence when it came White House policies that many believed she would find objectionable. “I would say not to conflate lack of public denouncement with silence,” Ivanka said in the interview. During her father’s campaign, Ivanka positioned herself as a defender of women’s rights, of sorts. Rights, as she understands them, seems to have emerged as a kind of corporate lean-in (a term she used during the CBS interview) approach with unworkable policies about maternity leave and childcare that overwhelmingly benefit women in her own tax bracket. She has remained silent on issues like abortion and birth control and said nothing when her father reinstated the global gag rule. She also said nothing publicly when her father agreed to remove mandatory prenatal care from insurance plans in his failed deal to reform the Affordable Care Act. 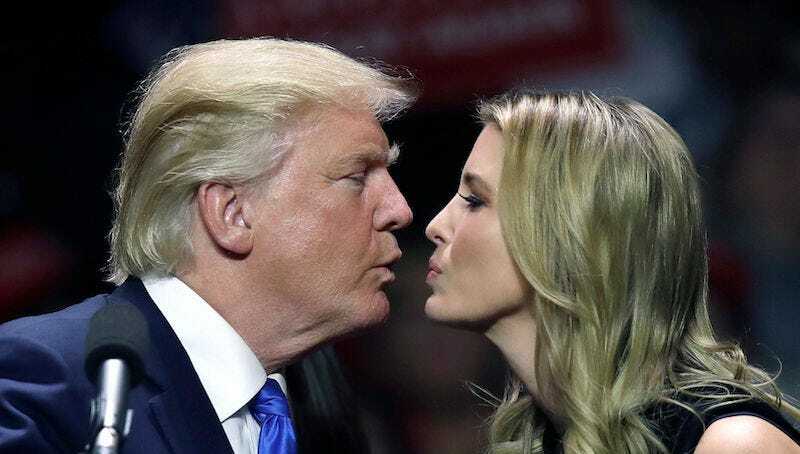 What’s become increasingly clear is that Ivanka Trump either is completely unable to sway her father even though she claims that he listens to her or that she simply doesn’t care about women’s rights. Indeed, even though she might join international leaders on panels about women in the workforce, the lives and well-being of women appears to be little more than yet another branding opportunity. Ivanka Trump might deny that she’s “complicit” and cry “feminism,” but what’s clear is that her politics are pure Trump and nothing more.